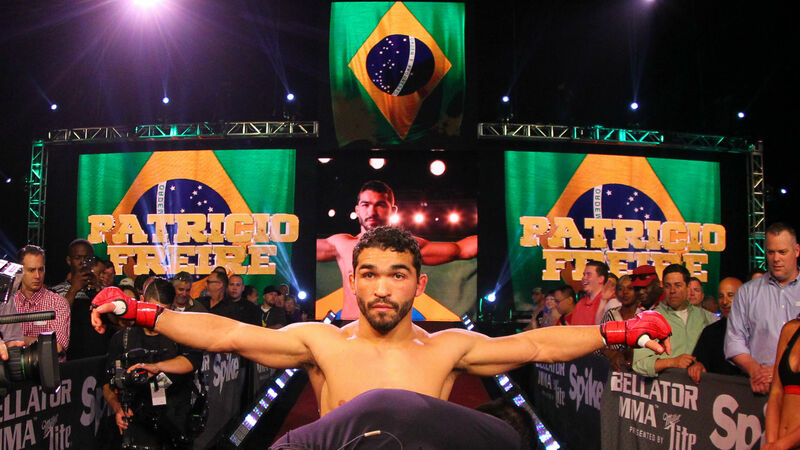 Where does Patricio 'Pitbull' Freire rank among the world's best featherweights? Patricio “Pitbull” Freire is one of the best fighters in Bellator MMA history and anyone who says otherwise is simply looking to argue the opposing side. By all measures — appearances, victories, finishes, title reigns, etc. — the 31-year-old featherweight champion, who defends his title against Emmanuel Sanchez on Thursday in Tel Aviv, Israel, is a first-ballot Hall of Famer for the organization; one of the most consistent and accomplished fighters to ever grace the Bellator MMA cage. Since his debut against Will Romero in April 2010, the talented Brazilian has won two featherweight tournaments (Season 4 and Season 9) while reaching the finals of another, two championship victories, and three successful title defenses. Overall, the current featherweight titleholder boasts a 15-4 mark inside the Bellator cage, with victories over former champions Daniel Straus and Pat Curran, perennial contenders Daniel Weichel and Henry Corrales, and respected veterans like Justin Wilcox, Diego Nunes, Wilson Reis and Georgi Karakhanyan. While some fighters end up being measured more by their losses than their victories, Freire’s setbacks all came against top competition and do not cast any negative light on his illustrious career. Although he has lost to both Curran and Straus, the younger half of the “Pitbull Brothers” avenged his loss to the former and holds a 2-1 edge over the latter after three fights, while his most recent setback against Benson Henderson at Bellator 160 was a result of an injury in a fight Freire was winning at the time of the stoppage. The only loss on his resume that he has not avenged or that cannot be clarified in some fashion is his first career defeat, which came by split decision against Joe Warren in the Season 2 featherweight tournament finals. Freire stands with fellow two-time champions Michael Chandler and Douglas Lima as the standard-bearers for Bellator MMA. While more recognizable and established names have been joined the promotion and garnered greater exposure in recent years, competitors like Freire have remained the more reliable, dependable and active athletes on the roster, further strengthening their association with the organization and adding to their impressive resumes along the way. But as with most tremendous talents who have passed through the Bellator cage at one point or another, the question of where Freire fits in the overall featherweight landscape is difficult to answer. The shiny gold belt that he’ll carry into the cage against Sanchez in Tel Aviv establishes him as the best fighter in the division under the Bellator MMA banner, but determining where he fits when factoring in the wealth of talent competing in the 145-pound weight class in the UFC and elsewhere is far more challenging. To his credit, Freire suggested that Bellator CEO Scott Coker investigate the potential of trading for former UFC featherweight kingpin Jose Aldo in the wake of the Ben Askren-for-Demetrious Johnson swap, going so far as to offer up his brother Patricky in return. Even though Aldo no longer sits atop the division, a bout with the two-time champion and all-time great is the type of matchup that is currently missing from his resume and would give observers a greater understanding of where he falls in the divisional hierarchy regardless of organizational ties. Featherweight is one of the deepest divisions in the sport, with fighters like Lance Palmer, Andre Harrison and Steven Siler leading the way in the Professional Fighters League, and Kevin Belingon and Bibiano Fernandes atop the ranks in ONE Championship to go along with the massive crop of talent who compete in the UFC Octagon each year. While there is no way to determine a definitive pecking order in the 145-pound division (or any weight class for that matter), unless the advent of trades finally opens the door to a once-a-year, champions-versus-champions clash to crown the best fighters on the planet, and speculating comes with the caveat that anything could happen in a fight to alter the outcome of some of these hypothetical meetings, it’s not unreasonable to view Freire as one of the Top 15 featherweights in the world right now, with a place in the Top 10 not out of the question. Though it would be difficult to project him beating impending UFC title combatants Max Holloway and Brian Ortega at the moment, and he would be an underdog in pairings with the likes of Aldo, Frankie Edgar, Renato Moicano and Chad Mendes, is it really that difficult to see Freire emerging victorious in a firefight with Jeremy Stephens? Would you favor Cub Swanson to beat him at this point in their respective careers? Josh Emmett? Ricardo Lamas? Darren Elkins? While some of the members of the next wave working their way up the divisional rankings at the moment like Mirsad Bektic, Alexander Volkanovski, Yair Rodriguez and Zabit Magomedsharipov represent difficult matchups — as do Palmer and Harrison — no one would count out Freire in any of those contests and victory over one or several of those names would certainly cement his standing as one of the best featherweights on the planet given all that he’s already accomplished inside the Bellator MMA cage. But right now, all we can do is speculate. Even though it is great to see quality talent competing around the globe in various strong, stable, and growing organizations, the dispersion of talent throughout various promotions means that there will be times where questions like this can never be answered and while most would rightfully suggest the UFC champion stands as the top fighter in each weight class, Gegard Mousasi and Rory MacDonald would like to argue otherwise at middleweight and welterweight, respectively, and Demetrious Johnson would like to have a word regarding the flyweight division. Coming to a consensus in discussions like this is never easy and some people like to turn them into semantic arguments about what the word “best” really means and how many fighters are encompassed in that classification, but given the richness of his resume and the established skills he brings to the cage, it feels safe to say that “Pitbull” is one of the best featherweights on the planet right now.